Looking for URL's to assign icons in the Marker window. I am having difficulty finding a site that has downloadable icons used by USGS, NPS, and USFS, any suggestions? 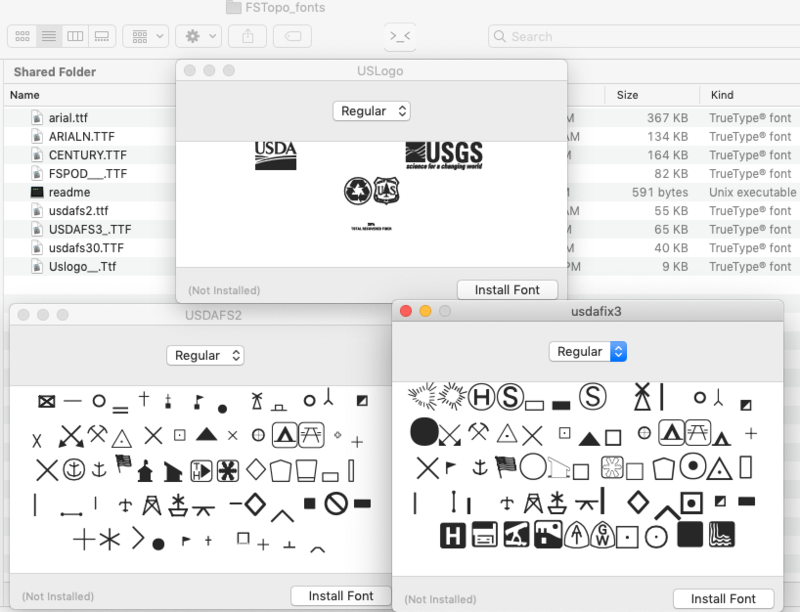 https://www.nps.gov/maps/tools/symbol-library/ — PNG and SVG symbols. Why create your own campground icon? Then look for FSTopo fonts. This is way tricker to use than raw SVG's. I have been successful in annotating PDFs with these Fonts, but you'll have to figure out the mapping between your keyboard and the FSFonts. The USGS has excellent tech support and a nationwide Map Liaison team. I think a well round of discussions with them to encourage open source of their icons would be great. I would love to get a symbology for dry lake, or wash or spring for use maps. I am still looking for good published SVG vector fonts. SVG stands for Scalable Vector Graphics. In the meantime, I am doing microsurgey on raw PDFs to extract my own SVGs. Is there a cross-reference table for the standard icon images / text names / typical uses on USGS (or other) maps? Alternatively, is there a future plan to create 'mouse-over' text, so that icons would be identifiable at the time of selection? With the current icon options, you can selected the color for many of the icons. For the 'Custom Icons' is there an image file format that one can create / upload for an URL that will allow colors to be assigned? Currently it will only appear as the black color that it is uploaded as and cannot be changed to blue, red, etc. I have also tried .png, .pcx and, .bmp file types, which often allow color interchangeability in other applications, but not here. Note, that the .png file type does allow a transparent background. We are working on redoing the icon set and making more of them colorable. For custom icons, with a pro account you can save icons to your account (instead of entering the URL each time in the marker selection dialog) and when you do that you can flag them as being colorable and/or rotatable. However the coloring doesn't work great on icons with partial transparency. Thank you. You are awesome as always. I have uploaded a few to my account, which you are welcome to share with the community and/or I can send you a link for them. If there is a way for me to upload them to a common library, I would happily do that as well. There isn't any kind of common sharing location at this point. The TH and snowflake symbols will most likely get included, they area already part of the NPS symbol set and we will be importing some of those, or re-stylized variants. There are no plans to add the IPP/LKP/PLS symbols, but we do plan to expand on the current 1-or-2-letter-in-circle icon, so that you could easily recreate those symbols by entering IPP etc.